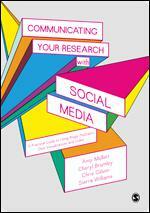 With Communicating Your Research with Social Media: A Practical Guide to Using Blogs, Podcasts, Data Visualisations and Video, authors Amy Mollett, Cheryl Brumley, Chris Gilson and Sierra Williams offer a definitive guide to communicating research using different social media tools. Reflecting on the utility of social media to all facets of the research landscape and lifecycle, this is a valuable book that will encourage readers to find the right platform for their voice, writes Andy Tattersall. If you are interested in this book and would like a taster of the content, the authors have written a series of posts to coincide with its publication. Communicating Your Research With Social Media: A Practical Guide to Using Blogs, Podcasts, Data Visualisations and Video. Amy Mollett, Cheryl Brumley, Chris Gilson and Sierra Williams. SAGE. 2017. If anyone was going to write a definitive book about communicating research using social media, it would be some of the people behind the various engaging blogs hosted by the London School of Economics and Political Science. The four authors either work or have worked for the LSE, and anyone who has ever followed the LSE Impact Blog will know that it has been at the forefront of social media and science communication for some time. Social media, like most of the web, is a cross between a goldfield and a minefield. There are opportunities aplenty for those who engage with it, but also many potential problems lurking below the surface. For most academics, it still appears an unknown land when they come at it from a wholly professional perspective. There are those who know what they are doing, and often doing it well; there are those who are not engaging with social media at all; and there are those who are but just aren’t sure why. All three groups can benefit from a book like Communicating Your Research with Social Media: A Practical Guide to Using Blogs, Podcasts, Data Visualisations and Video, as no matter what you think you know about social media as part of your research communication, it probably isn’t enough. This is because social media is in a constant state of flux, always changing and always spiralling off into new areas. Like the gold- and minefield analogy, many of these require some degree of support to help navigate them successfully. Whether you are new to Twitter or mastering video, podcasts and blogging as part of your research communication lifecycle, you still have things to learn. This title begins quite rightly at the theoretical and historical end of social media, which it covers in adequate depth. As with learning to drive, there is the practical and there is the theoretical: the latter in this case helps put some flesh on the bones as to why the web is how it is and what that means to anyone working in academia. The authors do this really well as they start out by defining social media from its early beginnings right up to recent times and how it has impacted for change on a global scale, such as through the Arab Spring and the Black Lives Matter campaign. Contrary to many people’s beliefs about social media in an academic setting, it is not just about learning to use a new technology: it is not like unpacking your new kettle, looking for the “on” switch and making your first cup of tea. It requires a reason to use that technology and considerations around that choice, which this book explains throughout. You can be told to use Twitter as it will help share your research, but you need to understand what the benefits will be as well as the potential barriers and costs. Thankfully, this book highlights those considerations through each practical chapter. 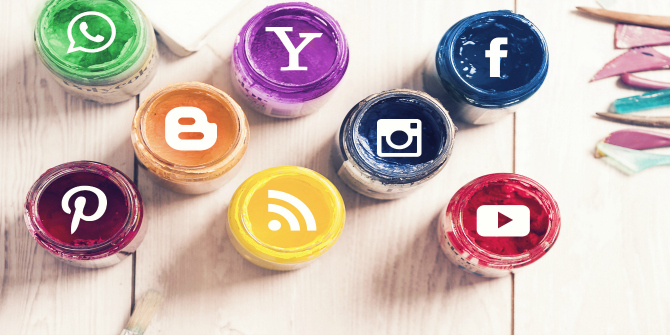 Image credit: Social Media Logos on An Art Background by Mike MacKenzie. This work is licensed under a CC BY 2.0 license. Quite importantly, the research lifecycle and social media are also given their own chapter as both are not mentioned in close proximity to each other nearly enough. Yet, to myself and the authors, these two spheres seem to have been destined to be together for quite some time now. For those familiar with the research lifecycle as it exists, in Chapter Two the authors present their own iteration broken into six areas: Inspiration, Collaboration, Primary Research, Dissemination, Engagement and Impact. Social media is linked to all six, and the book addresses those connections to reflect on what the research landscape looks like for those who have embraced these digital opportunities. The next four chapters are well-signposted and cover the main areas of interest: writing blog posts; creating infographics and visualisations; making audio and podcasts; and creating videos and images for social media. Each sets out to define these areas as there are plenty of academics still unsure what each element is and how it applies to their world. So the book’s approach is to work from the basics upwards and give clear signposting along the way. The blog chapter tackles that most fundamental of problems: “what to write about?” Advice on this and how to structure your blog (with the temptation being to just write a shorter version of your research paper) are plenty as well as on applying the right tone. Careful consideration is also given as to what platforms to go to when first starting your blog. The tone is light and positive so that anyone coming in from a basic level entrypoint will not feel overwhelmed by the content. The chapters regularly pause to ask questions to guide the reader towards understanding the reason for applying any of these digital approaches to their research communication, whilst also containing no shortage of textual and visual examples of cases studies to inspire the reader to consider as part of their own application. The chapters also make clear connections between what a tool is and how it can be applied in research communication: an area many academics fail to link. For those looking to overhaul their research practices, keen to communicate their findings and ideas and to future proof their work, the book is a good place to start. Useful waypoints are added throughout the book so you can assess your progress before launching any new social content. The temptation when given new creative tools is to rush and get content out there for your peers and the world to see. Yet if the data is distorted, unreadable or not properly labelled and branded, you could be left with problems. Thankfully, the book sets out key checkpoints throughout to negate that, a good example being the infographics and data visualisation checklist which asks seven important questions before publishing your poster and data. The book also comes with a useful companion website that includes blog posts on everything from social media and the research lifecycle to guides on using Twitter and making podcasts. Communicating Your Research with Social Media does not require the reader to start at page one and work through it in a linear fashion. As with many books, it can be digested in one large sitting or bit-by-bit as and when needed. How you engage with this book will also depend on your level of ability to use social media professionally: it is important to note a difference here between this and how you use it on a personal level. The book is aimed at a very wide market: from students to established academics, from professional support staff to journal publishers and funding bodies, all will have useful things to take away from the text. As with other work written by the authors about social media in research, this book is another valuable addition to the collection. Of course, with everything social media these days, there is no getting away from Donald Trump, who is mentioned six times. But his appearance is a reminder that in these uncertain times, with the suppression of experts and research evidence, it has never been a more crucial period for academics to learn new digital skills. The authors conclude that the research lifecycle has in many ways always been a social process, so it should make good sense to employ new digital technologies of communication to aid that. By communicating your research, not only can academics build networks and possibilities for collaboration, gather evidence of impact and share their research, but they can be a voice of truth in a world of fake news. To do this they must first find a platform for their voice, and this book will set them off on the right path or move them further along it. Andy Tattersall is an Information Specialist at The School of Health and Related Research (ScHARR). He writes and gives talks about digital academia, learning technology, scholarly communications, open research, web tools, altmetrics and social media, particularly their application for research, teaching, learning, knowledge management and collaboration. Andy is a member of The University of Sheffield’s Teaching Senate and a Fellow of the Higher Education Academy. Andy is also Secretary for the Chartered Institute of Library and Information Professionals – Multi Media and Information Technology Committee. He has edited a book on Altmetrics for Facet Publishing which is aimed at researchers and librarians. He tweets @Andy_Tattersall.